Michell Instruments and sister company Ntron show-case ranges of humidity sensors and oxygen analysers for laser powder-bed additive manufacturing at Hannover Messe. Laser powder-bed manufacturing, or metal additive manufacturing, has revolutionised the product development process. Using metal powder, complex 3D shapes are built up layer by layer directly from CAD models. The process makes it possible to produce complete objects and components in a single process. Often the components are used for applications in aerospace, defence and transport so strength and quality are vital. To ensure the quality of the end-product, the powder, the parameters of the laser and the atmosphere in the chamber must be tightly controlled. The process takes place in an inert atmosphere of nitrogen or argon, with O2 levels controlled to around 0.1 to 1.5% to avoid oxidisation. Gas analysis manufacturer, Ntron, offers a range of zirconia-based oxygen analyzers and sensors for use in additive manufacturing. 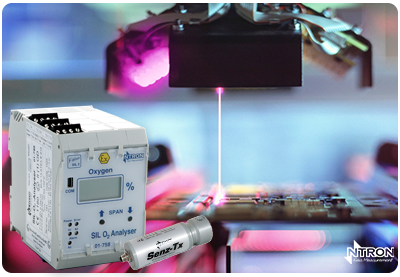 The SIL O2 is an in-line SIL 2 rated oxygen analyser, designed specifically for harsh applications in the additive manufacturing process. Application include monitoring oxygen levels in inert gases to prevent explosions and meets the requirements of IEC61508 SIL 2. The Senz-TX is a reliable and cost-effective two-wire, loop-powered oxygen transmitter which uses zirconia technology for a fast response with no drift. In addition to the risk of oxidisation, moisture contamination is now becoming recognised as a potential quality issue that affects the integrity of the end product. Traditional metallurgical process – such as sintering – require dry, inert atmospheres to ensure strength and reliability, and metal additive manufacturing is no different. Michell Instruments has over 40 years of experience in producing humidity transmitters and analyzers for industrial processes where dryness is essential for product quality. The Easidew series of dew-point transmitters has a choice of 5/8” UNF, 3/4” UNF, G 1/2” process connections and 4-20 mA output for easy integration in to modern 3D printers. Its measurement range is between -110 up to +20°C dew point, for processes where dryness is essential. The intrinsically safe Easidew I.S. has global certification for use in hazardous areas. Visit Michell Instruments and Ntron at Hannover Messe, Hall 11, stand B72 to find out more.